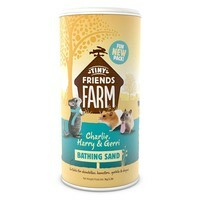 Tiny Friends Farm Bathing Sand is 100% natural and suitable for gerbils, chinchillas and degus. This dust free bathing sand has been tested for perfect grain size and density. This bacterially clean product ensures a dust free atmosphere for your small pet and penetrates their fur structure to give healthy clean skin. The grain quality is extra soft, leaving your small animal's delicate fur undamaged and excess skin oils removed. Tiny Friends Farm Bathing Sand will leave a glowing coat and healthy skin. I do think this is very good dust. Our girls love it. The cardboard packaging makes it easy to store and very easy to pour .